Watch the Falls come alive on this breathtaking evening tour of Niagara Falls Canada. Your guide will start your evening off with a trip to the Journey Behind the Falls where you travel deep below and behind the heart of Niagara. Stand in the mist of the mighty Horseshoe Falls as water rushes down 13 storeys and crashes on the rocks below. Explore the bedrock tunnels leading to the Cataract Portal and Great Falls Portal, which is one-third of the way behind the massive sheet of water. Once you have ascended back to the top, your guide will take you through the Table Rock complex as well as enjoy scenic views from the brink of the Horseshoe Falls. Your journey does not end there. Armed with a unique sense of humor and a passion for the history of the Niagara Falls region, our fully licensed tour guides will provide you with fascinating fun facts and commentary of the rich history the areas posses. A relaxing drive on-board one of our comfortable coaches will take you along the Gorge to see the fierce Whirlpool that is formed by the river along with the Class V rapids. Beauty will abound you when you stop at the Floral Clock as well as views from the School of Horticulture. Once the sun has set over Niagara, you will be escorted up to the top of the 775-foot Skylon Tower to take in the panoramic scenery of the region under a blanket of darkness off set by spectacular lights. 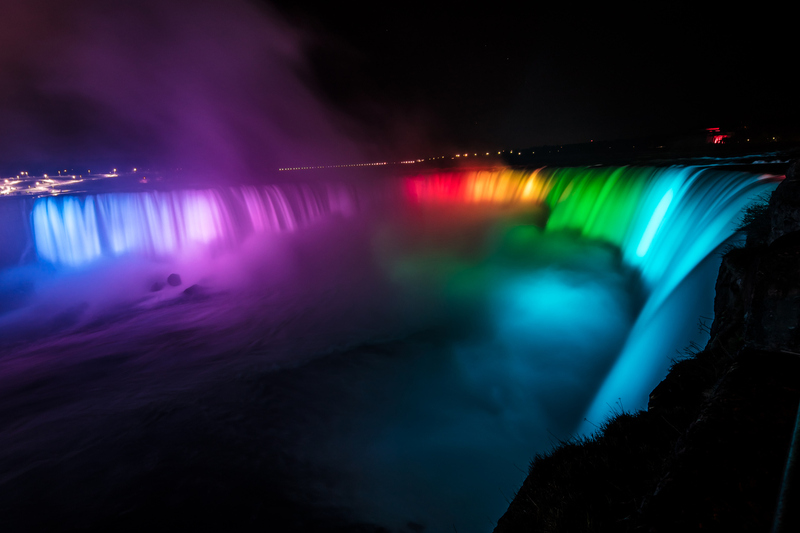 Witness a certain romance from the Falls as it’s Illumination of candy-colored lights gives off a tranquil glow. Complimentary Hotel Pick-up and Drop-off is available for most downtown Niagara Falls USA Hotels. Your pick-up time will depend on your hotel, so 24-hour prior confirmation is required. A full refund issued by ToNiagara if your tour is cancelled at least 24 hours before scheduled tour departure (this includes any issue arising at the U.S.A/Canada Border. NO REFUND will be issued if the tour is cancelled less than 24 hours before scheduled tour departure time. BUFFALO DEPARTURES: 5PM(TOUR START TIME), There is an additional US$40 fee for Buffalo pickups, which must be paid to the driver (pickups from downtown Buffalo and Airport Hotels only).